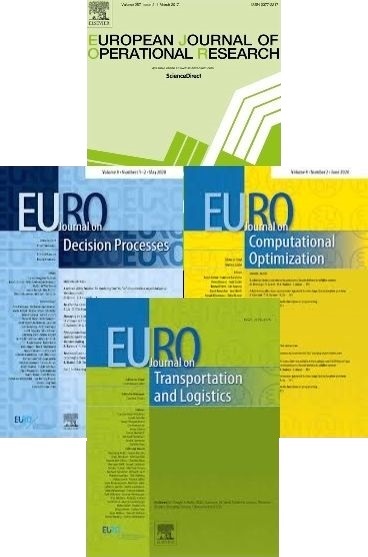 If there is a suitable recipient, the prize is awarded at each EURO-k Conference to an early stage scientist on the basis of a doctoral dissertation in any area of Operational Research. Early stage scientists are either PhD students or scientists having less than two years research experience since completing a PhD. The jury selects a short-list of finalists who will present their work in a special session of the EURO-k Conference. There is no registration fee for each finalist. EURO will also contribute to the travel and accommodation expenses. The winner will be determined by the jury at the end of the special session and will be announced by the chair of the jury during the closing session of the Conference. The prize for the winners is a distinct honour, and in material terms consists of €1,000 and a certificate. The entries will consist of doctoral dissertations that were completed after the competition deadline of the previous EURO Doctoral Dissertation Award. The dissertation must have been defended in a university located in a member country of EURO. The author of the dissertation must be a member of a member society of EURO. All applications should be sent to the Chair of the EDDA jury by the due date set in the announcement. The text of the dissertation. An extended abstract (3 to 5 pages) of the dissertation; this abstract should be written in English and should include precise keywords. No nomination will be considered without these items. The selection jury consists of five members of recognized stature in the OR community. The jury includes a core of three members who serve normally a period of three prizes, with one member added at each prize edition. The new member is nominated by the EURO Executive Committee (suggestions will be asked to the jury core) and approved by the EURO Council. The chair is normally the member who is in the final year of service. The EURO EC then selects additionally two members serving only for the current prize edition and keeps the EURO Council informed about the decision. Care should be taken to make sure that the selection committee is representative of the various areas of OR. The jury members must be members of one of the EURO member societies. If any member of the award jury has a past or current relationship with a nominee that might influence the selection process for reasons other than the merits of the case relative to the award, it is the responsibility of each jury member to bring to the attention of the jury chair such a conflict of interest. The jury chair should propose a response that ensures that the final decision of the jury is exempt from any conflict. Only one award may be made on each occasion. Then, the selection process consists of two phases. Quality of the related publications. These finalists are invited to present their contribution in front of the jury and any other interested participants during a special EDDA session scheduled at the EURO-k conference. The jury selects the final winner after the session. t - 2 years New member proposal by the jury core. Approval of the EDDA jury core new member by the EURO Executive Committee and EURO Council. t - 1,5 year Selection of additional jury members by the EURO Executive Committee. t - 1 year EURO Executive Committee keeps EURO Council informed about the additional jury members. Call for applications by EDDA jury chair/EURO office. t - 5 months Deadline for applications. t - 4 months Decision of the jury, the jury chair informs the EURO Office. The EURO Office contact the finalists to inform them about the special session and make arrangements for their registration. t EURO Conference: presentation by each finalist, final selection, award delivery.